This entry was posted in Bank House Fishing Reports on December 22, 2011 by Ben Dobson. This entry was posted in Bank House Fishing Reports on December 16, 2011 by Ben Dobson. BEST TIGER 2lbs 12oz to Mr? SPORT: Bank House Fly Fishery has fished well this week despite a real change in the weather. 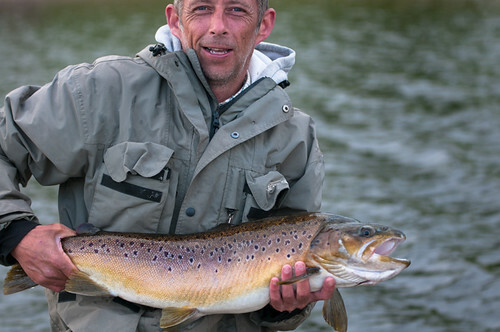 Pete Bramwell took nine trout all to a brown damsel pattern. Pete found the trick was to keep on the move and fish right round the water. Mr D Cannon also tempted nine trout the best of which was a cracking rainbow of over 10lbs. Mr Cannon caught most of his fish on gold buzzers his best area was the Mill Pool. Dennis Tallentire landed eight fine rainbows and blues. His best fish tipped the scales to 12lbs and was tempted by a cat’s whisker. Norman Chapman from Liverpool had a great bag on Saturday and almost completed the Bank House McNab, he just needed that elusive tiger trout. He did land a brownie of 4lbs 3oz, rainbow of 3lbs 4oz and a blue of 3lbs 11oz. His bag was topped though by none other than his fishing buddy Dave Simmons. Dave bag of four included two rainbows of over 5lbs and totalled 17lbs 15oz. These big fish have continued come out from all over the water. The average weight of the fish killed last week was 3lbs 2oz and that doesn’t include the two doubles as they were returned to fight another day. Norman and Dave’s best pattern was a black fritz but damsels, Cat’s and buzzers have continued to fish well. The lodge pool, witches Island and the swim have probably been the most productive areas. Tight Lines Ben and Charlotte. This entry was posted in Bank House Fishing Reports on December 7, 2011 by Ben Dobson.